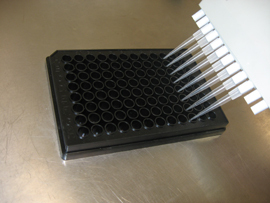 Lactose Assay Kit | Cell Biolabs, Inc.
Lactose is a naturally occurring disaccharide found in milk. After ingestion, lactose is broken down into glucose and galactose by the enzyme lactase. Lactase deficiency, or the inability to digest lactose, can result in high levels of lactose in the blood. Our Lactose Assay Kit measures total lactose in milk based food products or biological samples (such as blood or urine from lactating mammals). Lactose is first cleaved into glucose and galactose by lactase. Glucose is then oxidized by glucose oxidase, yielding hydrogen peroxide and D-gluconic acid. The hydrogen peroxide released from this reaction is detected by a fluorometric probe in a 1:1 ratio. Lactose levels in unknown samples are determined based on a lactose standard curve.